The Android build system compiles app resources and source code, and packages them into APKs that you can test, deploy, sign, and distribute. 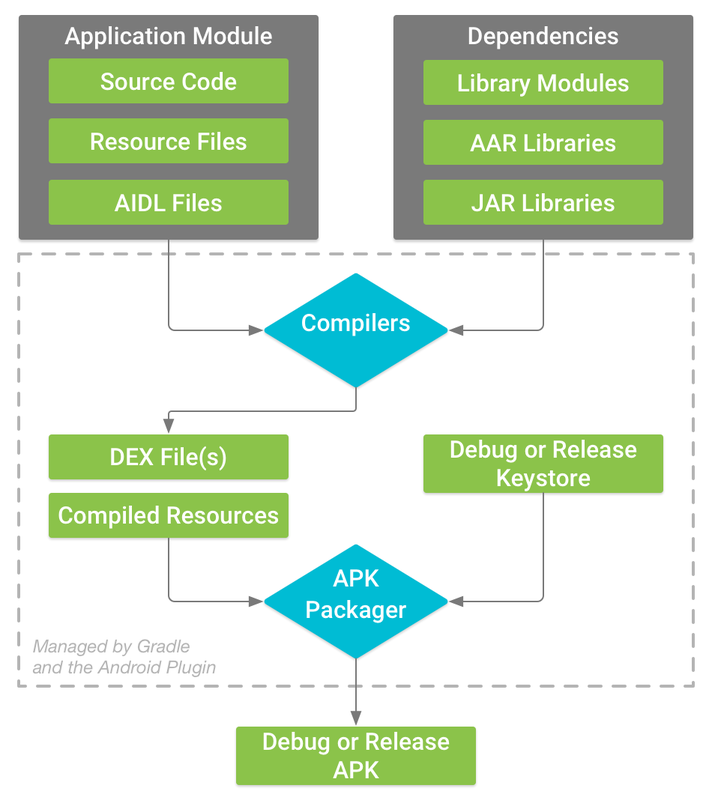 Android Studio uses Gradle, an advanced build toolkit, to automate and manage the build process, while allowing you to define flexible custom build configurations. Each build configuration can define its own set of code and resources, while reusing the parts common to all versions of your app. The Android plugin for Gradle works with the build toolkit to provide processes and configurable settings that are specific to building and testing Android applications. Gradle and the Android plugin run independent of Android Studio. This means that you can build your Android apps from within Android Studio, the command line on your machine, or on machines where Android Studio is not installed (such as continuous integration servers). If you are not using Android Studio, you can learn how to build and run your app from the command line. The output of the build is the same whether you are building a project from the command line, on a remote machine, or using Android Studio. Note: Because Gradle and the Android plugin run independently from Android Studio, you need to update the build tools separately. Read the release notes to learn how to update Gradle and the Android plugin. The flexibility of the Android build system enables you to perform custom build configurations without modifying your app's core source files. This section helps you understand how the Android build system works, and how it can help you customize and automate multiple build configurations. If you simply want to learn more about deploying your app, see Building and Running from Android Studio. To start creating custom build configurations right away using Android Studio, see Configuring Build Variants. The build process involves many tools and processes that convert your project into an Android Application Package (APK). The build process is very flexible, so it's useful to understand some of what is happening under the hood. Figure 1. The build process of a typical Android app module. The compilers convert your source code into DEX (Dalvik Executable) files, which include the bytecode that runs on Android devices, and everything else into compiled resources. The APK Packager combines the DEX files and compiled resources into a single APK. Before your app can be installed and deployed onto an Android device, however, the APK must be signed. If you are building a debug version of your app, that is, an app you intend only for testing and profiling, the packager signs your app with the debug keystore. Android Studio automatically configures new projects with a debug keystore. If you are building a release version of your app that you intend to release externally, the packager signs your app with the release keystore. To create a release keystore, read about signing your app in Android Studio. Before generating your final APK, the packager uses the zipalign tool to optimize your app to use less memory when running on a device. At the end of the build process, you have either a debug APK or release APK of your app that you can use to deploy, test, or release to external users. Build types define certain properties that Gradle uses when building and packaging your app, and are typically configured for different stages of your development lifecycle. For example, the debug build type enables debug options and signs the APK with the debug key, while the release build type may shrink, obfuscate, and sign your APK with a release key for distribution. You must define at least one build type in order to build your app—Android Studio creates the debug and release build types by default. To start customizing packaging settings for your app, learn how to Configure Build Types. Product flavors represent different versions of your app that you may release to users, such as free and paid versions of your app. You can customize product flavors to use different code and resources, while sharing and reusing the parts that are common to all versions of your app. Product flavors are optional and you must create them manually. To start creating different versions of your app, learn how to Configure Product Flavors. A build variant is a cross product of a build type and product flavor, and is the configuration Gradle uses to build your app. Using build variants, you can build the debug version of your product flavors during development, or signed release versions of your product flavors for distribution. Although you do not configure build variants directly, you do configure the build types and product flavors that form them. Creating additional build types or product flavors also creates additional build variants. To learn how to create and manage build variants, read the Configure Build Variants overview. You can specify values for some properties of the manifest file in the build variant configuration. These build values override the existing values in the manifest file. This is useful if you want to generate multiple APKs for your modules where each of the apk files has a different application name, minimum SDK version, or target SDK version. When multiple manifests are present, Gradle merges manifest settings. The build system manages project dependencies from your local filesystem and from remote repositories. This prevents you from having to manually search, download, and copy binary packages of your dependencies into your project directory. To find out more, see Add Build Dependencies. The build system enables you to specify signing settings in the build configuration, and it can automatically sign your APKs during the build process. The build system signs the debug version with a default key and certificate using known credentials to avoid a password prompt at build time. The build system does not sign the release version unless you explicitly define a signing configuration for this build. If you do not have a release key, you can generate one as described in Sign Your App. The build system enables you to specify a different ProGuard rules file for each build variant. The build system can run ProGuard to shrink and obfuscate your classes during the build process. The build system enables you to automatically build different APKs that each contain only the code and resources needed for a specific screen density or Application Binary Interface (ABI). For more information see Build multiple APKs. Creating custom build configurations requires you to make changes to one or more build configuration files, or build.gradle files. These plain text files use Domain Specific Language (DSL) to describe and manipulate the build logic using Groovy, which is a dynamic language for the Java Virtual Machine (JVM). You don’t need to know Groovy to start configuring your build because the Android plugin for Gradle introduces most of the DSL elements you need. To learn more about the Android plugin DSL, read the DSL reference documentation. When starting a new project, Android Studio automatically creates some of these files for you, as shown in figure 2, and populates them based on sensible defaults. Figure 2. The default project structure for an Android app module. 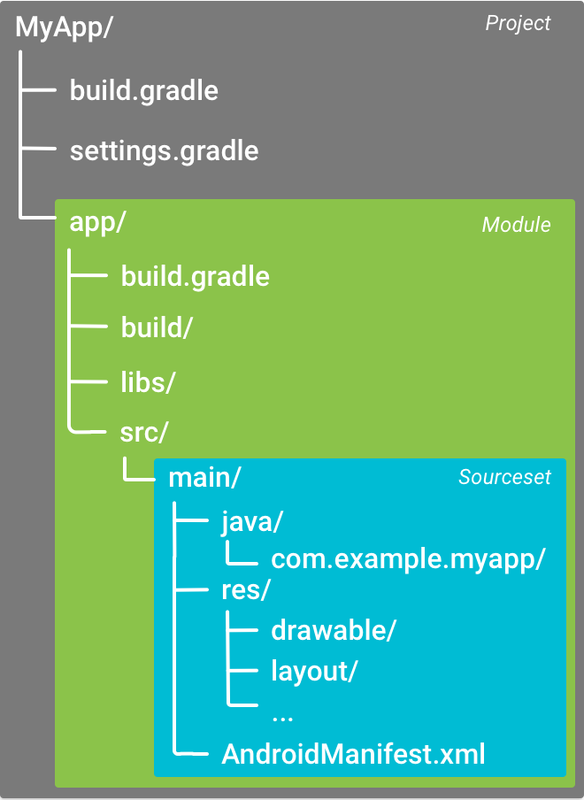 There are a few Gradle build configuration files that are a part of the standard project structure for an Android app. Before you can start configuring your build, it is important to understand the scope and purpose of each of these files, and the basic DSL elements they should define. However, multi-module projects need to specify each module that should go into the final build. The top-level build.gradle file, located in the root project directory, defines build configurations that apply to all modules in your project. By default, the top-level build file uses the buildscript block to define the Gradle repositories and dependencies that are common to all modules in the project. The following code sample describes the default settings and DSL elements you can find in the top-level build.gradle after creating a new project. * needs to build Android app modules. * JCenter as the repository Gradle should use to look for its dependencies. * version 3.4.0 as a classpath dependency. * configure any dependencies (unless you select a template that requires some). For Android projects that include multiple modules, it may be useful to define certain properties at the project level and share them across all the modules. You can do this by adding extra properties to the ext block in the top-level build.gradle file. // You can also create properties to specify versions for dependencies. // Having consistent versions between modules can avoid conflicts with behavior. To access these properties from a module in the same project, use the following syntax in the module's build.gradle file (you can learn more about this file in the section below). Note: Although Gradle allows you to define project-wide properties at the module level, you should avoid doing so because it causes the modules that share those properties to be coupled. Module coupling makes it more difficult to later export a module as a stand-alone project and effectively prevents Gradle from utilizing parallel project execution to speed up multi-module builds. The module-level build.gradle file, located in each project/module/ directory, allows you to configure build settings for the specific module it is located in. Configuring these build settings allows you to provide custom packaging options, such as additional build types and product flavors, and override settings in the main/ app manifest or top-level build.gradle file. This sample Android app module build.gradle file outlines some of the basic DSL elements and settings that you should know. * this API level and lower. * download the build tools using the SDK Manager. * the build tools by default. * these values for different versions of your app. * applicationId uniquely identifies the package for publishing. * defined by the package attribute in the main/AndroidManifest.xml file. // Defines the minimum API level required to run the app. // Specifies the API level used to test the app. // Defines the version number of your app. // Defines a user-friendly version name for your app. * The buildTypes block is where you can configure multiple build types. * build type applies Proguard settings and is not signed by default. * shrinking, using minifyEnabled, and specifies the Proguard settings file. minifyEnabled true // Enables code shrinking for the release build type. * The productFlavors block is where you can configure multiple product flavors. * are optional, and the build system does not create them by default. * Play Store, or an Android device, simultaneously. * and assign each flavor to a flavor dimension. // Settings to build multiple APKs based on screen density. // Enable or disable building multiple APKs. // Exclude these densities when building multiple APKs. exclude "ldpi", "tvdpi", "xxxhdpi", "400dpi", "560dpi"
* specifies dependencies required to build only the module itself. * To learn more, go to Add build dependencies. This is where you can configure project-wide Gradle settings, such as the Gradle daemon's maximum heap size. For more information, see The Build Environment. Configures local environment properties for the build system, such as the path to the SDK installation. Because the content of this file is automatically generated by Android Studio and is specific to the local developer environment, you should not modify this file manually or check it into your version control system. When you make changes to the build configuration files in your project, Android Studio requires that you sync your project files so that it can import your build configuration changes and run some checks to make sure your configuration won't create build errors. To sync your project files, click Sync Now in the notification bar that appears when you make a change, as shown in figure 3, or click Sync Project from the menu bar. If Android Studio notices any errors with your configuration, for example, your source code uses API features that are only available in an API level higher than your compileSdkVersion, the Messages window appears to describe the issue. Figure 3. Syncing the project with build configuration files in Android Studio. This source set includes code and resources common to all build variants. Create this source set to include code and resources only for a specific build type. Create this source set to include code and resources only for a specific product flavor. Create this source set to include code and resources only for a specific build variant. Note: When you create a new file or directory in Android Studio, using the File > New menu options, you can create it for a specific source set. The source sets you can choose from are based on your build configurations, and Android Studio automatically creates the required directories if they don't already exist. This allows Gradle to use files that are specific to the build variant you are trying to build while reusing activities, application logic, and resources that are common to other versions of your app. When merging multiple manifests, Gradle uses the same priority order, so each build variant can define different components or permissions in the final manifest. To learn more about creating custom source sets, go to Create Source Sets for Build Variants.